I have just migrated to AAISP from TalkTalk. 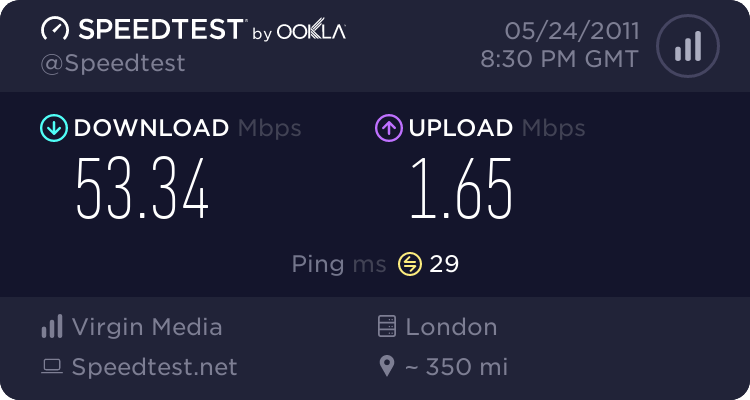 With my old ISP TalkTalk, my ADSL1 service slowed to an absolute crawl in the evenings making even browsing frustratingly slow. I have an IP profile of 7150 kbps and tests direct to the BT Speedtester site almost always give 6600 + kbps results. TalkTalk, while admitting the problem appeared to be in their network, were unwilling or unable to do anything about it. 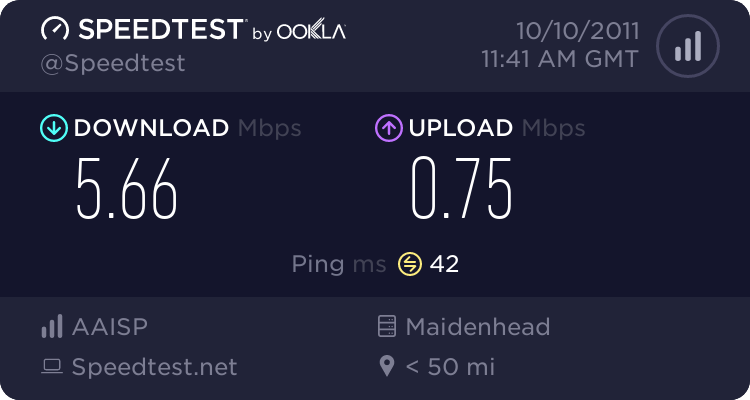 I live in a small village so am restricted to IPStream services so decided to give AAISP a try. What a difference! I am now getting 6600 + kbps ALL THE TIME! I can now watch youtube and other streaming services something I never could with TalkTalk at busy times. It's not 100% percent rosy however. My TalkTalk service (ex freedom2surf) was unlimited, not that it helped me much! While I am unlikely to exceed the 50GB per month it is going to be all too easy to exceed the 1.25GB daytime allowance particularly as it is now so fast. Just windows updates and general browsing will get me close to, if not exceed that figure. It's probably just a case of changing my usage pattern; only time will tell. The second problem, not a problem to me or I suspect the vast majority of people here, are the AAISP control pages. They are absolutely full of jargon and a nightmare for anyone who is not a "geek". I asked my wife to take a look at them to see what she thought. She said that "It might as well be written in Chinese". She didn't even want to continue after hitting the "Security Certificate" warning. As she is in the IT Industry and runs courses on MS Excel, Word, Powerpoint and Access she is not a complete airhead! Some might say that there is no need to go here for the average user but, as far as I can see, they have to be negotiated to get the "Usage" data. That data is pretty essential if you don't want to run up big bills. Just one question. It appears to be suggested in some posts that there is a special "night time" rate. I don't see any mention of it in my 1.25GB/50GB two unit tariff. Re: New User Initial Thoughts. The night-time special rate does exist, every day, between 2am-6am, metered at 1 unit per terrabyte (1000 gigabytes). If you can, schedule any non-immediate downloads during these hours. In the control panel where it shows you your unit breakdown, there is a "Full" hyper-link at the bottom. Clicking this will show it. By default, any units for each tariff that are still 0.00 units (eg. you've not transferred enough traffic within those hours for it to clock to 0.01) are hidden from view. Clicking on "Full" will show you everything. The 1.25 Gb per unit is pretty low for 20CN connections, I must admit, but be warned, you can eat through that fairly rapidly. When 21CN arrives at your exchange, definitely try and move onto that to get more peak time allowance. Clicking on "Full" will show you everything. AAISP uses CACert to sign it's SSL pages, and CACert is not trusted by default in most browers. I'd definitely consider using them again if the tariffs were brought up to date and avoided charging daytime users quite as much. And those latency graphs are pretty cool, too. Were you not tempted by 60GB 8am to midnight, unlimited free usage midnight to 8am for £17.99 per month? Yes I was - I was just a little afraid to go for another big company. AAISP has a good reputation for not being the bottleneck and as I am out between 9am. and 6pm most days the daytime rate hopefully will not be a problem. If it is I shall move again.. I should say I'm not with AAISP but I would presume their broadband usage quotas are skewed to try and get usage at the night time in line with the business fibre connections (that will mainly be used during the daytime) so that their network as a whole uses pretty much the same throughput at any time during the day therefore creating the best value for money when AAISP are negotiating Transit contracts. If AAISP didn't provide fibre business connections I'm pretty sure that you'd get more usage during the daytime than in the evening.